My house is foreclosed on, my job is outsourced, and my wife runs away with a banker. So…,I figure there’s nothing left to do but pack up the old mini-van, head on down to New Orleans and start a new life as a singer of blues. My border collie, Woof, rides shotgun, his handsome muzzle sticking part way out the window. Woof and I have worked out a way of communicating that started when he was a pup. It began as a simple, binary system. I realized early on that, while border collies are the smartest of dogs, I happened to have a genius of the species! I began by asking Woof simple questions to which he could bark once for “Yes” and twice for “No.” I’d wait till I knew he was good and hungry and then I’d ask him, “Are you hungry, boy?” If he barked once, I’d reward him with food. If he barked twice, he’d get nothing. He soon caught on. Gradually, we advanced to metaphysics. I decide to head for the Gulf Coast because the President has said we can eat the food and swim in the water. The networks have shown a picture of the Prez and Sasha laughing in the waves. How anyone can tell it’s the Gulf is totally beyond me. You’d think with all the technology, they’d be able to get a satellite picture. They can read license plates from space, can’t they? So… they could have had a long shot with an expanse of water and it would be clear from the general topography that it was the Gulf; then they could get closer and closer until we see plainly it’s POTUS himself gimbling in the wabe. It’s just like when I hear they’re testing the seafood by having people smell it. “You’d think they’d have a more sophisticated way of knowing whether something’s safe to eat, wouldn’t you”? I ask Woof. Woof barks once. He gives me one of his iconic, ironic looks. 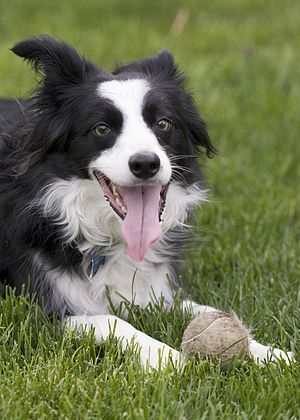 That, of course, is another thing about border collies–why they’re so good at herding. They can hold your eyes; they let you know with their big, black eyes! Driving down I-85, I get spun around Atlanta and wind up in the East Point ghetto. Some 30,000 people have shown up to get about 800 Section Eight applications. We high-tail it out; that many desperados sends up my blood pressure. I’ve seen riots begin with far less provocation than thousands of absent forms (and the inadequate housing they signify!). We tool past Montgomery. Back in the 70s, cops had frisked me there because I was walking around downtown with long hair, looking like the anti-war, long-haired, pot-smoking hippie that, in fact, I was. It was during a short break on a Greyhound Bus cross-country trip, and I had the balls to complain to the friskers afterwards that they had no right to harass a guy for taking a stroll around their fair city. A white guy could still say such things back then without getting bopped on the head… but, with Homeland Security, I wouldn’t recommend it now…. I still have long hair—though some mite thinner and grayer, matching the grizzled look I’ve acquired thanks to the heartaches of living. “Wasted and wounded, it ain’t what the moon did, I got what I paid for now,” Tom Waits sings from my C.D. as we drive past ugly Mobile and pretty Lake Pontchatrain. And lickety-split we’re in the Big Easy, promenading in the French Quarter, in the Vieux Carre, down Bourbon Street, et. al. There are black kids dancing on a street corner—dancing good!—and people dropping coins or dollar bills into their caps; there are college girls flashing their cotton-candy breasts on a dare and for the fun of it; and sad-eyed, dark-mascaraed hookers in the business far too long; and dragging-trousers John Does holding out their palms for greasing. I follow my heartbeat to Preservation Hall. It’s like an old saloon inside with all kinds of people sitting on benches, listening and grooving. And the music revives me because … black and white, old and young, male and female—we are joined in the temple of reverberations: they go down into marrow; the stuff that can’t be killed though it wallows; the stuff that gets damn near to dying then rises up again. I’d left Woof to do his thing with a vivacious French poodle and we meet at the van a couple of hours later. “You’re not going to be a singer?” he asks me with his eyes. I assure Homer that I know what he means. “Now… this English Lit degree here…. You won’t be lookin’ ova my shoulder here correctin’ my gramma’?” Homer wonders. I assure him I can, though they both smell a little rancid to me. Homer gets a call on his Blackberry and holds up his index finger for me to wait. “That’s pretty much all there is to it,” he affirms when he’s done. “We’ll get you a nice, starchy uniform with your name on it an’ you ken start bright-early Monday. It’s easy. Most of the stuff is good, ya see.” Homer nods and I know what he means, and he knows that I know. And so I become a smeller for the Empire. Day after day I am in a big room with a few white guys, a few blacks and a lot of illegals looking at the haul of the day from the shrimpers and the other vessels, opening up oysters and smelling them, until it all collides like the odor of one awful ordure in our heads. Every day I hear Tammy Wynette and “Jerry! Jerry!” from the front office and also some Mexican ballads coming out of the juiced-up Sony headphones on the senora sitting next to me, and every day I stamp “approved” on the official forms with my neo-cortex exploding. And once in a while I hear CNN in the background—how there’s a big fuss over whether to put a mosque near Ground Zero…, but nobody’s mentions the fact that our “combat mission” in Iraq is over, and our corporate-military complex butchered over a million humans because some idiots claimed their leader had weapons he never had. In the evenings, I walk with Woof along the beach, watching the sun melt in the water. If I dig my toes deep into the sand, my toenails emerge shining with a thin, oily film. “I wonder what Corexit smells like?” I ask Woof. “I wonder if it breaks up the smell of the oil?” He looks at me with doleful eyes, and there’s nothing more doleful than a border collie’s doleful eyes. Woof barks twice, letting me know it’s okay. Woof barks once. “You can go back now,” his eyes tell me, “back to the Vieux Carre…. You’re ready now. The crust is coming off your eyes. You can sing your own song now—the song of the one and the all.” And he barks again. A pelican wheels over the Gulf as the red sun dips behind it. A couple of gulls caw in the violet-red-ochre… and it’s almost like it used to be…. But will never be again. Gary Corseri’s articles, poems, fiction, and dramas have appeared in hundreds of online and hard-copy venues, including, Dandelion Salad, Atlantic Free Press, Thomas Paine’s Corner, The New York Times, Village Voice, Cyrano’sJournalOnline, L.A. Progressive, and CommonDreams. He has performed his work at the Carter Presidential Library and Museum. He has published two novels (Holy Grail, Holy Grail and A Fine Excess), a literary anthology (Manifestations, edited), two collections of poems, and his dramas have been performed on Atlanta-PBS and elsewhere. He can be contacted at gary_corseri@comcast.net. This entry was posted in All Posts News Politics and-or Videos, Dandelion Salad Featured Writers, Environment, Oil and/or Fossil Fuels, Politics, Poverty and tagged BP-Deepwater Horizon Oil Disaster, BP-Deepwater Horizon Oil Disaster on Dandelion Salad, Corseri-Gary, Creative Writing. Bookmark the permalink.